Informazione prodotto "Behringer Launch Controller CMD Touch TC64"
The CMD TOUCH TC64 is a powerful music controller that enables you to create music or mix tracks via its ultra-intuitive, 64-button multicolored launch grid – which provides instantaneous feedback on each button’s status. CMD TOUCH TC64 works seamlessly with Ableton Live* and virtually any other DAW software, so you can produce truly professional tracks that are simply amazing! Thanks to TC64’s Launchpad compatibility mode, you get complete functionality within Novation’s Launchpad* app for iPad – a standalone performance app that not only lets you create and record your music, but share to it instantly using your iPad. And since it’s bus powered (no external power required), the TC64 is completely portable – just connect to your computer or iPad via USB and take it anywhere. The TC64 is the ideal clip-triggering and MIDI event controller, with 64 buttons that are brilliantly backlit in multiple colors and respond to MIDI feedback. All the performance buttons are laid out in an 8 x 8 grid and conveniently color-coded, so you always know what going on. Across the top and down the right side, you’ll fi nd 16 additional buttons for Mode (TOUCH TC64 and Novation Launchpad S emulation), navigation, Session, User 1 & 2, Mixer, Track control and more. Whether you’re a DJ, producer, recording engineer, or hobbyist, the CMD Touch TC64 makes getting a hand on your software easy and affordable. Designed to work as a standalone controller for a wide range of DJ and production software titles, TC64 provides everything you’ll need right out of the box, allowing you to trigger and manipulate clips, loops, effects and control your mixer – plus much more. The CMD TOUCH TC64 connects directly to any available USB port on your Mac* or PC using the supplied USB cable. You can also connect to an Apple* iPad* or other iOS device via either the Apple Lightning* to USB Camera Adapter, or the Apple iPad Camera Connection Kit USB adapter for older 30-pin devices. And the TC64 provides fully class-compliant MIDI operation, so there are no additional drivers to download – just connect and go. 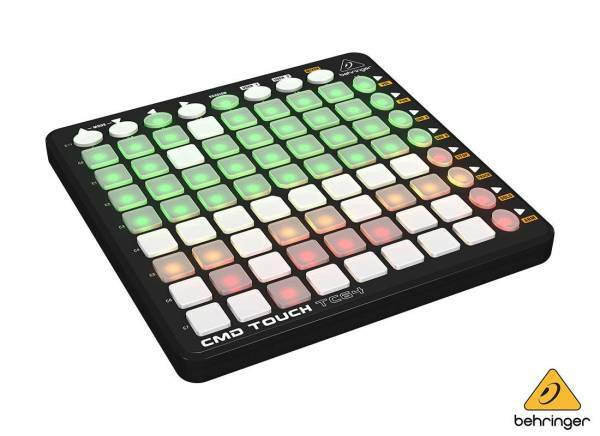 Thanks to its convenient and user-friendly grid layout, the CMD TOUCH 64 is everything you’re looking for in a USB, clip and MIDI event controller. With 64 tactile, multicolored finger pads that make the most of MIDI and more, generating mesmerizing, great-sounding tracks just got easier – and a whole lot more affordable. Sii il primo a scrivere una recensione per: "Behringer Launch Controller CMD Touch TC64"